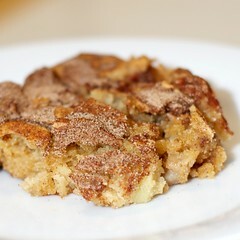 Spendwise Moms: Apple Squares - Perfect for Fall! Apple Squares - Perfect for Fall! The ones I make look similar to this. She has the same ingredients in hers, but some ingredients call for different amounts. 2 cups pared apples - core and peel apples, and then chop or dice cut apples into very small pieces. Melt butter. Beat in sugars, eggs, cinnamon and vanilla. Stir in flour baking powder and salt. Stir in apples and walnuts. Spread into greased 9 x 13 pan. Sprinkle with cinnamon and sugar mixture. Bake at 350 for 35 minutes. Cool and cut into squares. I usually make 1/2 of the recipe. We eat a few and then freeze the rest.